Minky (or Minkee) is a super soft variety of fleece fabric that is very warm. It is produced from 100% polyester fiber or microfiber and comes in many colors and textures. It was originally used for babies’ products because of its soft feel, which is warm yet lightweight. Now it’s also popular for quilt backings, blankets, and winter wear for all ages. Our minky fabric comes in a wide range of colors, from soft and muted to bright and bold. Read further for more info on Minky, including choosing the right kind and how to work with Minky. 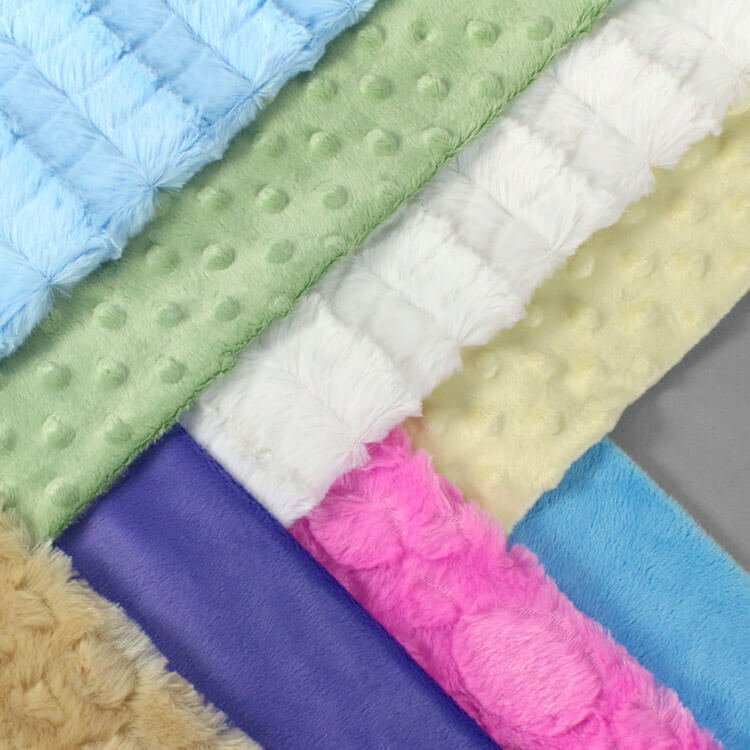 Minky or cuddle fleece, as it is sometimes known, may have a low pile or longer fibers that are cut to form a surface texture or pattern. Smooth Minky is a tried and true option with a smooth, uniform pile length. Minky Dot has a raised dot pattern with a relatively short pile. Minky Rose Swirl has long fibers that are swirled to create a rose-like pattern. Sherpa Minky looks like the Sherpa fleece that is often used as linings for hoodies and other warm apparel or accessories. It has the characteristic softness of Minky. Minky Stripe has a long pile that is formed to look like luxurious animal fur. One consideration when choosing a Minky is the pile length, as this will affect the warmth. Longer surface fibers will trap more air and make it warmer so if this is a requirement, choose one with a more fluffy pile. Some less expensive varieties of cuddle fleece and Minky may pill. 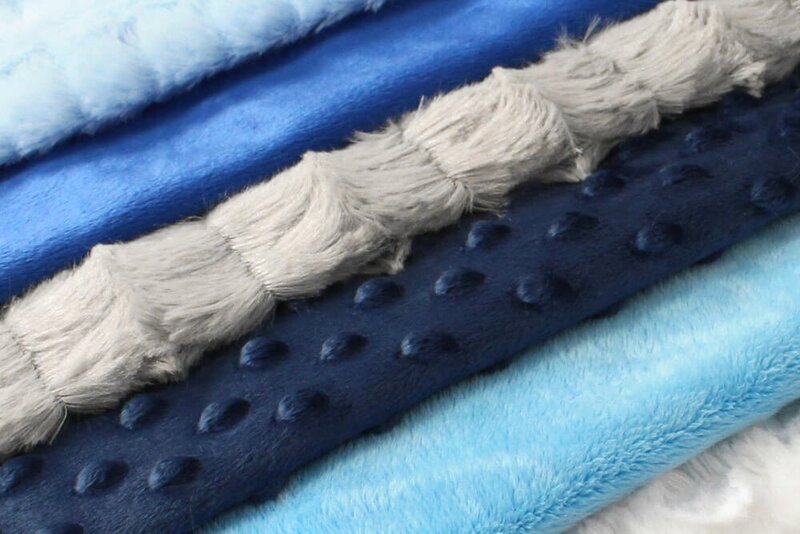 A good quality Minky, however, will retain its soft smooth surface, so expect to pay a bit more for a cloth that will look good for a long time. Minky is a soft, lightweight fabric that has a slight stretch as a result of its knitted construction. The stretch makes it comfortable to wear, but this could be a problem when sewing it if you don’t know a few tips to prevent it stretching out of shape. One of the great things about Minky is it washes very well and will stay soft even after many washes. Machine wash on cold. It can be tumble dried on low heat, but drying flat is recommended. You can pre-wash the fabric, if you wish, using the method you plan to launder the finished garment, but it isn’t necessary. But make sure to pre-wash any other fabric that you are using with the Minky that might shrink. Examine the nap of the fabric and make sure all the pattern pieces are lying in the same direction before cutting out. Check the direction of the stretch too and follow any guidelines on the pattern instructions referring to the direction of the stretch. Use sharp shears to cut through the layers of Minky as they may be quite bulky. Minky will shed fibers where cut, so it can be messy, especially the types with longer fibers. You can try putting tape on the wrong side and then cut on the tape to minimize stray fibers. Choose a fine to medium (75/11 to 80/12) universal or stretch needle when sewing with Minky. Good quality polyester thread is the best choice to sew with as it has some ‘give’ and works well with the stretch of the fabric. Whether you are placing the paper pattern to the fabric or holding cut pieces together for seaming, use long pins. Pins with pearl or flower heads will be less likely to get lost in the depth of the cloth. Because the fabric is stretchy, pin closely together. You can also use a wash-away tape or basting spray to hold the fabric together. If using a sewing machine for construction, a few handling tips may help to produce a good finish. Minky is bulky and flexible so it can stretch out of shape when the feed dogs progress the cloth under the needle. To prevent this, fit a walking foot to the sewing machine or place strips of tear-away stabilizer under the seam while you sew. Both of these methods help to reduce the stretching and rippling that could otherwise occur when sewing seams or hems. You can also try fitting a roller foot, more often used to sew oilcloth or vinyl coated material. If sewing with other types of fabric, like cotton, it’s best to put the minky on the bottom so the feed dogs can help pull it through. Choose a stretch stitch for joining pieces of cuddle fleece fabric so that the thread will not break when the garment is worn. If your machine does not offer a stretch stitch option, choose a narrow zigzag instead. A 1/2″ seam allowance often works the best. Consider plain and flat fell seams for this fabric. As the cut edges tend not to ravel, a plain seam with the seam allowances placed to one side then top stitched through all layers gives a functional and flat seam finish. 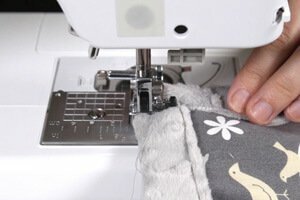 A serger (overlocker) offers an alternative means of construction and with its differential feed feature, the problem of stretching does not occur. Use a four-thread balanced stitch or flatlocking to join fabric pieces. In particular, the flatlocking option gives flat, bulk-free seams and, when used with decorative threads, some attractive finishes can be achieved. There is normally no need to iron Minky, but if you think it is necessary, use a pressing cloth and turn the iron to low or minimum. Too much heat will melt the fabric. For the same reason, do not microwave Minky. Click here to see all the different kinds of minky and the wide range of colors. can I use minky on the back of a cotton quilt?